This is the documentation for the nuget package Unity.SelfHostWebApiOwin. The package is dependent on Katana 2. Step 1: Create a Console application. This will be used to start the application or could also be your windows service. Step 2: Add a class library to the solution. This will be used to define the web api service. Step 3: Add the nuget package. 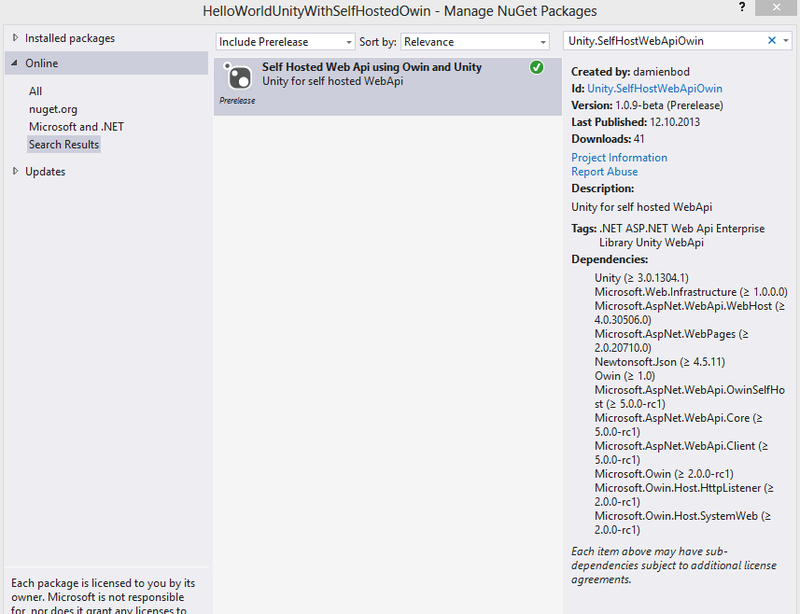 Open the nuget manager and search for Unity.SelfHostWebApiOwin. The console application also requires the Owin assemblies, if it is a separate project. Step 5: Add your startup logic as required. The startup here is just a place holder. This must be replaced. Step 6: Add your startup method to the console application. If custom filters are required and need to be injected, the unity build up is already configured. You only need to create the filter attributes classes. Here’s an example of a ActionFilter with property injection. The application can be tested using fiddler. A complete working example is provided on github.